When droves of Irish immigrants were forced to flee to America in the 1840s, they brought with them precious culture from the Emerald Isle — including the traditional Irish pub. 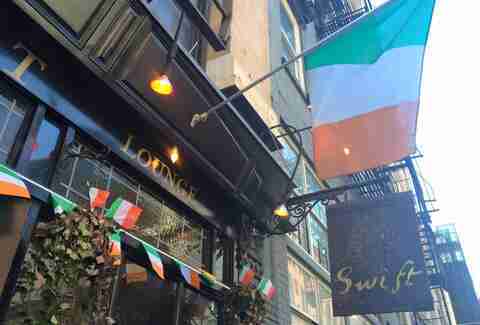 Today, New York City is home to myriad Irish bars where you can pound Guinness and whiskey — so many options, in fact, that it can be a challenge separate the real-deal digs from their less authentic replicas. So we sifted through the clover to bring you the absolute best Irish bars throughout the city, where you can always expect draft beers, loads of whiskey, tasty bites, and an especially jubilant crowd — whether it’s St. Patrick’s Day or not. 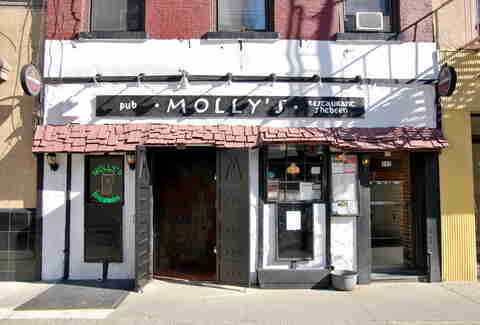 Molly’s has lived a few lives at its Third Avenue location. It began as a bar in the 19th century, started selling groceries during Prohibition, and eventually pivoted back to booze post-repeal. Things have hardly changed since the early 1960s, when it became a Tudor-style Irish pub (there’s sawdust on the floor, wood-worn bench booths, vintage photos, and plenty of Irish staff). It’s also home to a 10-ounce bacon cheeseburger and a great shepherd’s pie — both of which pair perfectly with the Irish beers on tap. 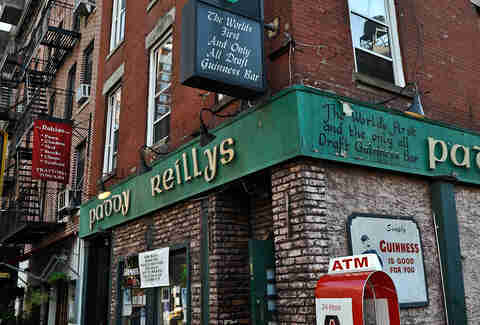 There are a few you should know about Paddy Reilly’s, other than that it’s been around for more than 30 years: 1) the bartenders here pour a perfect Guinness, 2) you can hear live bluegrass, classic rock, and (most often) traditional Irish music every night of the week, and 3) seriously, have a Guinness. This is the kind of place that actually makes you feel like you’re in Ireland, rather than Murray Hill. In operation since 1868, this storied Hell’s Kitchen pub has since seen plenty of renovations and owner changes over the years (the third floor was a speakeasy during Prohibition), but it still manages to maintain its old-school feel with an original mahogany bar and tin ceilings. Most importantly, it continues to serve excellent Scotch eggs, shepherd’s pie, and plenty of whiskey. Named after Irish writer Jonathan Swift, this cozy NoHo bar is the perfect place to go with someone you want to talk to without having to shout. There are plenty of snug tables to camp out at (particularly up front) and a solid craft beer selection that goes above and beyond what you expect from a typical Irish pub (that means drafts of Erdinger Hefeweizen and bottles of Saison Dupont). Still, things are decidedly Irish here, namely the down-home food like shepherd’s pie and corned beef & cabbage tacos. This totally unassuming, shamrock-speckled Staten Island bar offers both $10 pitchers and the best burger in Staten Island (a thick and juicy half-pound patty on an English muffin with crinkle-cut fries). It’s definitely a local haunt (particularly when there’s a game on), but it’s also been known to drag out some non-locals. This corner pub in Woodside happens to be located on one of the most populated streets in Queens, though you’d never know it from the inside. 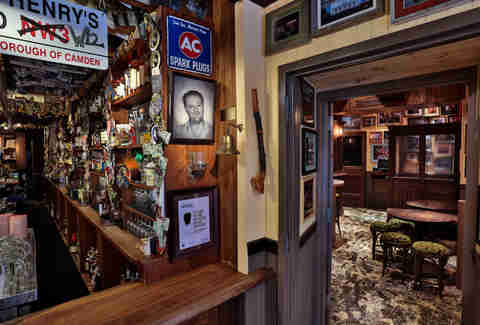 The cozy tavern, which has maintained its Celtic spirit in a nearly unchanged space since 1966, is speckled with antiques and stained glass windows, and offers a reliable selection of on-tap beers and famously beefy burgers. Located next to the 9/11 Memorial, O’Hara’s (which was a common drinking ground for Ground Zero workers after the attacks) is lined with police and fire decals and still boasts a beautifully random mix of patrons (on any given night you can find tourists, finance guys, and neighborhood locals all drinking here), plus draft specials every day. 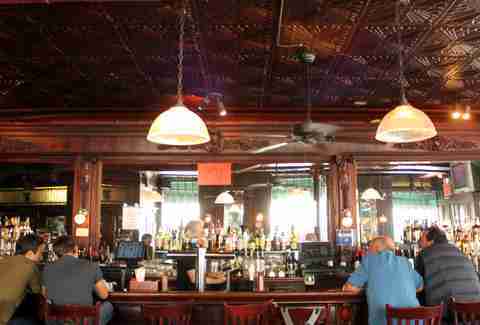 The Bronx is home to one of the most authentic Irish bar experiences in the whole city. 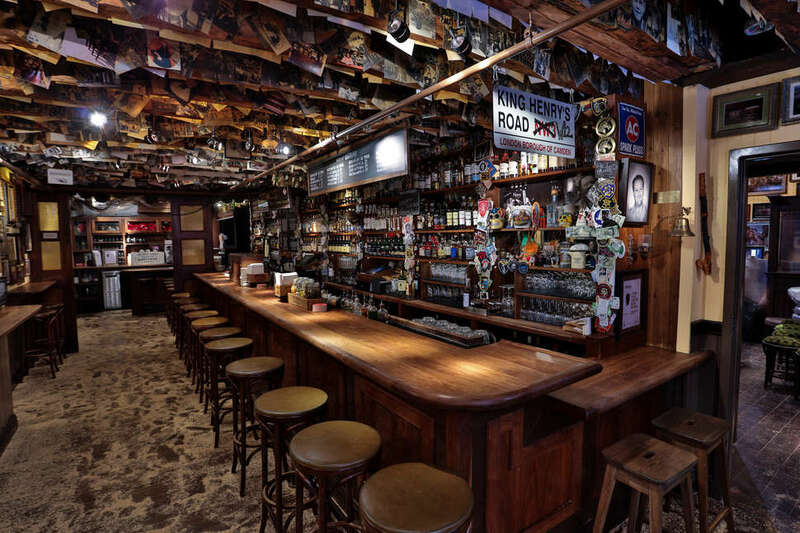 This tiny pub is filled with old knick-knacks, a snug L-shaped bar, and a handful of scattered tables, and offers live music, poetry readings, and comedy shows from both local and Irish artists nearly every night. Grab a seat and choose from a generous selection of bourbons, whiskey, and Scotch, to pair with traditional Irish comfort foods like bangers and mash. 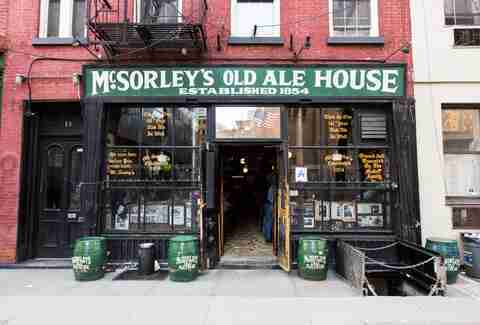 McSorley’s is a New York institution. The historic pub has been pouring drafts in the East Village since 1862, making it the oldest tavern in the city (it was one of the last “men-only” pubs in New York — finally allowing women in 1970). It serves a limited menu (burgers and dogs, liverwurst sandwiches; a cheddar or American cheese plate) and famously offers just two beers — the house ale, in either light or dark varieties, two for $5.50. A frequent winner of casual titles such as “World’s Best Bar,” this tri-level FiDi cocktail bar (run by two Irishmen) is really more of an ode to the Irish pub. Its ground-floor taproom has a wooden bar, old photos covering the walls, and an enormous whiskey list. Upstairs is strictly about the cocktails, notably the Irish coffee, made with Irish whiskey, demerara syrup, French press-brewed coffee, and fresh whipped cream. If this Bay Ridge pub looks a little like a church, that’s because most of the interiors — beer barrels, stained glass windows, and a wooden bar — were all shipped to Brooklyn from a monastery in Cork, Ireland. The rest of the place, where merry imbibers sip beneath ceiling a mural featuring floating monks with beers in hand, is a little more down to earth. 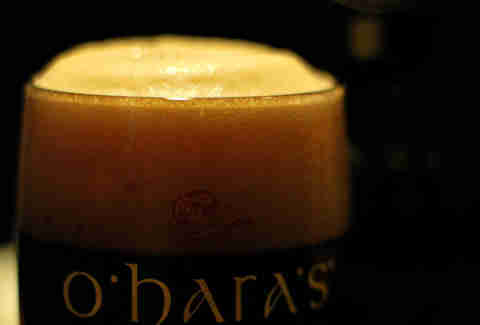 Grab a seat at the bar, order a Guinness, and make friends with the locals.